This article is about the arguments in favor of the use of EEG headsets, such as NeuroSky MindWave Mobile, for meditation. General questions of EEG meditation and various applications for PC are described in this article. Practitioners of meditation may wonder why EEG headsets are needed, because one of the main requirements of meditation is to stop the internal monologue (which is sometimes also called an internal dialogue), and this requirement can be fully implemented by the practitioner's mind without any headsets. The superficial answer goes like this - in most cases, when, after some time after the strong-willed termination of mental noise, the meditator loses control over the mind and begins to think again (for example, how to meditate best), first, he / she is not immediately able to notice the loss of control over the mind in the process of meditation, and the mental noise continues for some time until the meditator notices this loss (and a timely sound signal comes out to help to know you are out of the state of meditation), and, secondly, until he decide that the actual practice of meditation during a purposeful meditation session is more important than those sometimes interesting ideas that inevitably can come to mind, as soon as it is slightly clarified by thoughtlessness. For example, because with a subsequent greater clarification of the mind, even more interesting thoughts can come. But EEG headsets with biofeedback have other undeniable advantages, which will be discussed later. 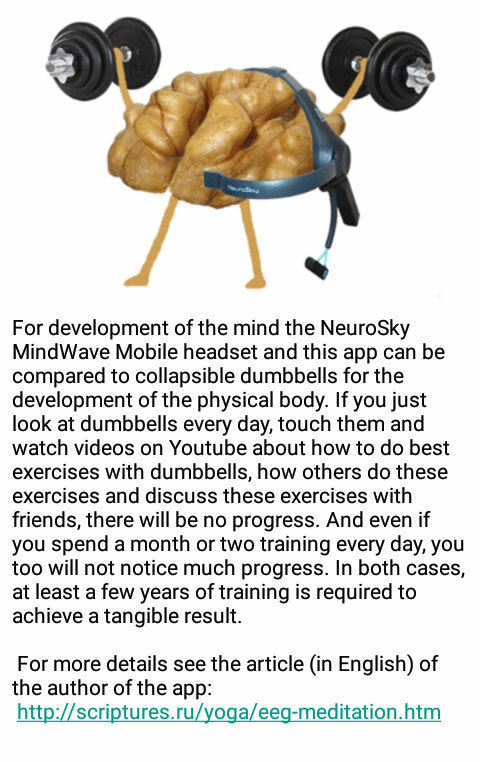 NeuroSky company made a truly revolutionary breakthrough in meditation, not only creating an outstanding mass cheap headset with dry electrodes, but also adding the "meditation" parameter to it. And the values of this parameter are generally consistent with what happens in the meditation process in the minds of experienced meditators, including practitioners of Transcendental Meditation® of Maharishi. It has become generally accepted that classical meditation is the predominance of alpha rhythm. In some lines of Buddhism, a significant increase in gamma-rhythm is added to the alpha rhythm during meditation. This is a question of some meditation techniques, and there is evidence that Zen Buddhism monks, who have dominated gamma rhythm for decades, naturally go over to the state of dominant alpha rhythm in the process of meditation. The author of this article for a couple of years put the most diverse experiments with NeuroSky MindWave headsets, including use two at once and compared the rhythms on two computers that appeared to be very similar, and noticed such features. Not always the most seemingly inspired spontaneous states of consciousness correspond to meditation and alpha rhythm, or they have a short duration of such rhythms. At the same time, a long regular practice can more or less guarantee a quick conscious transition into a state of meditation. The undeniable advantage of EEG meditation is that an impartial headset will signal about exit from the state of meditation whenever you exit the state of meditation. Someone can categorically assert that the headset allegedly shows something wrong there, and that he supposedly knows how to meditate, but the rhythms of the brain are directly related to the state of mind. This is science. Alfa rhythm has been linked with meditation. Yes, there are incredibly advanced yogins in the Himalayas, and not only in the Himalayas, who can do miracles with their bodies, including playing the rhythms of the brain as they like, and at the same time being in a state of superconsciousness. But now the point is that in the absolute majority of cases, experienced meditators in the state that is commonly called meditation, show the prevailing alpha rhythm. And EEG headsets can reliably track this alpha rhythm. In different traditions of Buddhism, there are different points of view on whether the eyes should be closed during meditation. Undoubtedly, closing eyes in many cases contributes to an increase in alpha rhythm. But, on the other hand, it also contributes to the sleeping, which spoils meditation. The exercises in visualization can prevent sleeping to some extent, and usually that is not accompanied by an increase of the noisy beta rhythm. In some Buddhist schools teachers speak of the need to close one's eyes during meditation, others speak about meditation with open eyes, and some teachers say about half-closed eyes at the time meditation ("One just looks down on the floor, right in front of one. You may call that having the eyes half closed."). With the EEG headset, you do not need to guess - you can always check how to meditate best at this actual moment. Because at one time meditation is better with closed eyes, and at other time you can quietly meditate tens of seconds with your eyes open in a quiet environment after intense mental activity. In such a situation EEG headset will do for you what only the clairvoyant guru can, who is able to see the state of the pupil's mind. The scriptures and many meditation teachers say that the diet of the meditator should be moderate. There should be neither fasting nor gluttony. EEG headset clearly shows the absence of alpha rhythm and meditation for a few hours after consuming abundant or heavy food. The theory of scriptures becomes an obvious practice with such a headset. You will understand why meditators with many years of experience try to pass to a vegetarian or even vegan diet. It is possible that in a state of meditation, some previously stored energy in the body is transformed into another, more subtle form of energy that promotes spiritual development, or during meditation conditions are created for the flow of previously stored energy into some higher parts of the soul, which ensures spiritual growth. Progress in the practice of meditation is slow, and it can be slowed down and rolled back by a lot of factors, including the unrighteous lifestyle of the meditator and his peculiarities of involvement in society. In other words, by the energy leaks. EEG headset clearly shows the current limit of the meditator. Try as long as possible to keep the ball in the air in the game Float of Brainwave Visualizer application, and you will see how after some time the ball will inevitably fall, no matter how hard you try. Each meditator has his / her current limit of duration of meditation. In Buddhist meditation, there is the concept of the sinking of the mind, when the meditator after some relatively long period of time (eg, 5-20 minutes) after the start of meditation believes that he / she still meditates, but in reality meditation is absent as such, even though there may be thoughtlessness. 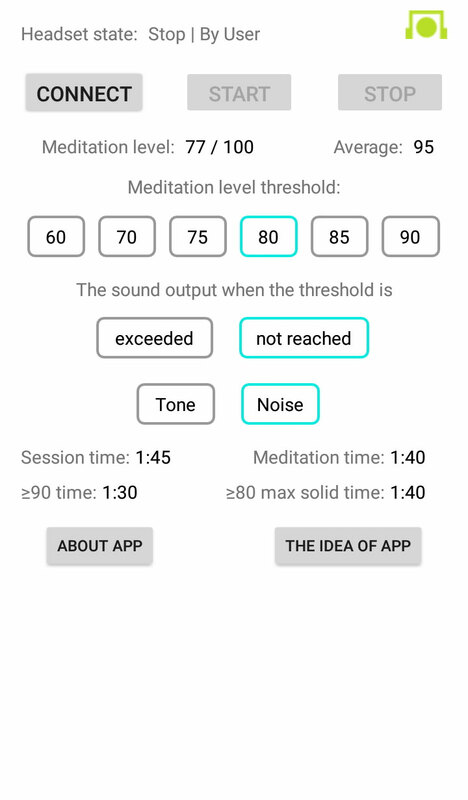 The headset clearly shows the lack of meditation in general and alpha rhythm in particular during the sinking of the mind, when the meditator has reached his current limit of the duration of the meditation session. Unlike the breach of thoughtlessness, the drowning of the mind is very poorly tracked by the meditator himself, and the EEG headset can provide invaluable assistance at this stage of the meditation session. When the mind is sinking, it looks like a stupor, when cognitive abilities fall, and the meditator continues imitation of meditation in a state of, say, fatigue and diminished awareness. Figuratively, this can be compared with the condition of a very tired driver, who has been driving for many hours. In this case, the meditator in such a limited state of consciousness may believe that everything is supposedly all right, that he is allegedly still controlling his condition and allegedly meditating. But EEG headset will clearly show that both the alpha rhythm and meditation is no longer there. In such a situation, it is better to stop meditation, to cheer up and only after a while to start meditating again, instead of continuing to amuse yourself with the illusion of supposedly long successful meditation. In addition, there are many promiscuous sects in the world that claim exclusive spirituality and incredible advancement of their leaders who allegedly reached unimaginable heights in Samadhi and are ready to “successfully” teach all people meditation "for a fraction". Such headsets make it easy to determine the possibility of "samadhi" of leaders of such sects and their trusted disciples from the inner circle. Imagine that you, as a beginner, want to choose a meditation studio for yourself. Will you go to such a yoga teacher that can demonstrate, for example, a half-hour predominance of alpha rhythm in a scientific way, or to someone who is hung up with diplomas of dubious origin, down to the corruption component, and is only pulling your leg when he talks about his progress in meditation? Transparency of declarations about the personal achievements of teachers of meditation with the help of electronic headsets is a necessity and undoubted advantage in building a civilized successful society of teachers of yoga and meditation. In the light of the above, it can be said that the EEG headset is an indispensable assistant to a purposeful meditator. Yes, it is possible to get success in practice of meditation even without a headset. But with a headset it will be faster. Any EEG headset resembles collapsible iron dumbbells. Like dumbbells, by itself, lying around, it does not help you. You need your regular practice if you want to achieve a tangible result. "One day a man came to me and said that he meditated for one hour every day for twelve years. He said that although he likes the sensations that he feels when he meditates, but in his opinion, when he talked with other people who practice meditation, it became clear to him that he probably does something wrong, because he does not experience any of those sensations that others experience. I measured his brain waves activity when he was in the state that he called meditation, and I found out that for all these twelve years this man spent an hour every day just to sit and think! Alpha and theta states, peculiar to meditation, were simply unfamiliar to him. In three sessions I taught him to enter a state of deep meditation, and when he first entered this state, he smiled broadly at me and said: "I did it!" Do not expect that with the purchase of the headset you will immediately begin to meditate like Buddha. Successful meditation requires proper training for a long period of time. But person can spend his entire life by thinking at the time of meditation, believing that he is meditating. The benefit of the EEG headset is at least in the fact that you can immediately know whether you are able to meditate. And also EEG headset helps to master the meditation faster with the help of biofeedback.